3D visualisations for architecture are a necessary tool but at one point this can become an addiction. Here I am, blending a simple picture display for my living room wall. It’s true my husband is not an architect and it’s a good idea for him to have a clear image of what’s in my head before he starts hammering nails in the wall. But the hidden truth is that I just can’t help doing it. 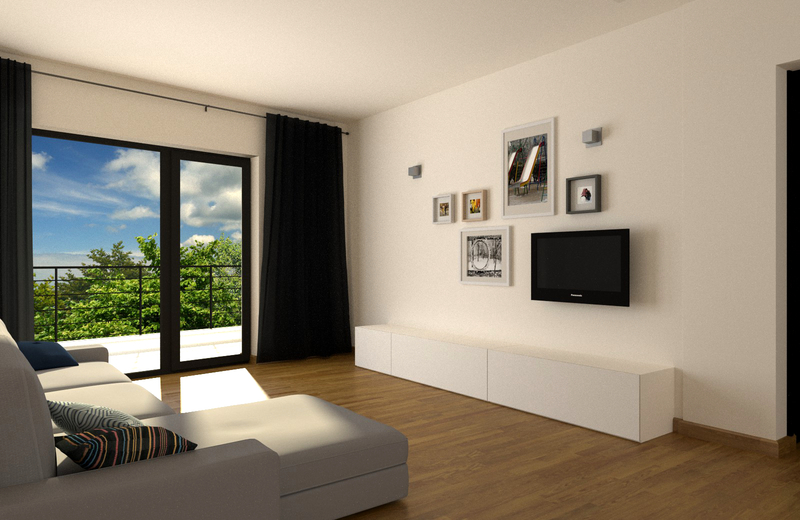 Before moving into our new apartment last year, I modeled it and started virtually planning it. It was really useful, especially for areas like the kitchen. It was an Ikea kitchen and the Ikea 3d planner is rather a good tool but the visualisation is not realistic and I wanted to convince my husband and myself on the color scheme so I used Blender. Before Blender, although I already worked in archviz I never did 3d for my own personal stuff because I had a crappy work flow, modeling in autocad and then rendering in 3dmax. Well, it was not actually that bad, as the projects come to me in dwg format so it made sense to model them right there in the dwg file, but then I had to move a lot between software if I wanted to make changes to the model. So I didn’t like to waste time rendering personal stuff just for the fun of checking things out virtually first. After all, I can draw and measure on paper (I can I can!). Also, because I didn’t learn to model in max, I didn’t do organic type of modelling much and didn’t go into making furniture and interiors except generic ones using some standard libraries. And interiors were harder to pull off back then. After switching to Blender, I had some trouble importing models from autocad at first, so I decided to learn to model with it, and my work flow improved so much that I started using 3d visualisations in a new way. If the modeling-rendering process is smooth and all in one place, visualising stops being the end result and becomes a part of the creative process. The grease pencil and the edge length are two Blender features that I started using more frequently. I am also starting to see that Cycles will increase this addiction with it’s real time previewing and stunning realism (btw, the image above with the TV area uses Cycles). The weirdest thing that happened was while getting some shelves on my girl’s bedroom wall. She is three and she caught me at my computer, making a quick render of her shelves. 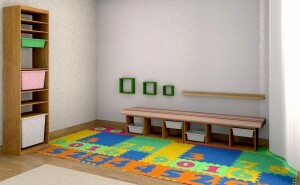 The kids room is rendered with BI. One of this days I want to make a really nice kid room packed with toys image for the gallery! I enjoyed so much reading this post of yours! I perfectly feel your points on this topic because – like you – I am the person in the family catching every occasion to sit down on the computer and design something. From my perspective this is not killing any ‘real’ skill at all, it is just a chance to make better decisions and to enjoy doing something useful. Out of curiosity, what do you use grease pencil for? I never learned how to use it. Wish my little one had the same attitude to keep things in order… but hey, he’s only 26 months old and there is still plenty of time left to learn. By the way we have the very same ‘coloured quads’ at home, only difference is that they are in our living room! Hi, nice to know you are a toddler parent too! 26 months is where the real fun begins 😉 Don’t worry, I was only talking about getting the shelves aligned. 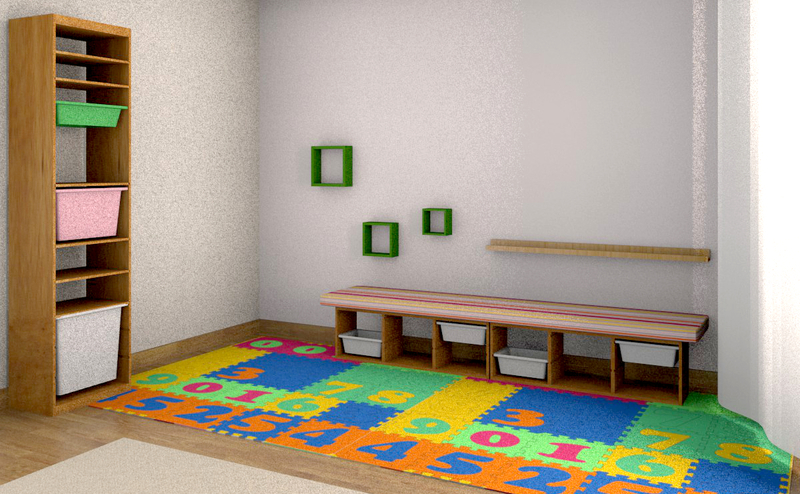 You must not think that room really looks anything like the render, it’s an adventure getting around without stepping on toys! Lots of questions indeed 🙂 and a bit too general, I could answer better on specific issues. There is some information scattered around the blog but it is mostly on modeling and the Blender Internal engine, the Cycles part it’s not well covered yet, as I’ve been using Cycles for a short period of time. You can find good tutorials on texturing on Blenderguru or Blender cookie; as a simple pointer, I use generated mapping rather than UV for architectural surfaces, due to tiling needs. I have some textures of my own but Cgtextures.com is a great resource fot free quality stuff. All the best in your study and thanks for posting! Feel free to ask stuff when in need.